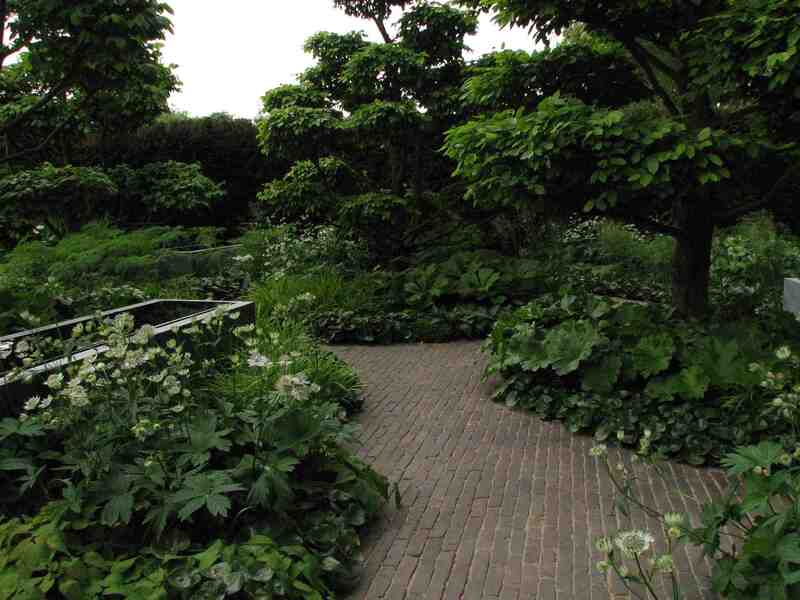 Landspace Design blog; landscape garden designers (London/Suffolk). Project news, awards etc. The summer blooms might feel like a distant memory but it isn’t just about the flower; so you might want to think twice before getting out the loppers. 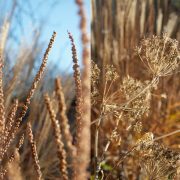 In our opinion there are many herbaceous plants and grasses that deserve to remain in the garden over the winter; there is nothing worse than staring at large patches of barren earth and longingly awaiting for the return of spring. Waking up on a frosty morning or after the first snow has fallen, to witness the intricate network of Sanguisorba ‘Red Thunder’ seed heads twinkling in Arctic sunshine or the majestic flower heads of ornamental grasses such as Miscanthus ‘Kleine Silberspinne’ or Calamagrostis ‘Karl Foerster’ shimmering in a wintry breeze; can truly lift the spirits. They are fantastic specimen plants and all add an invaluable dimension into what could be a bleak winter scene. dramatic and majestic towering spires and Dipsacus fullonum (Teasel). The Teasel is a magnificent, statuesque addition to the back of a border and is loved by bees when in flower and is invaluable winter fodder for seed loving birds. Many plants have a lot to offer when they’ve past their blooming best and it’s always good to remind yourself that the beauty of a plant isn’t always about the flower. 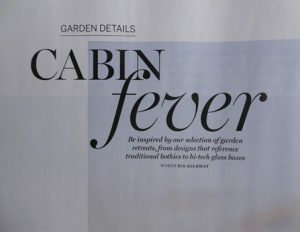 Landspace were thrilled to be included in an article by Zia Allaway entitled ‘Cabin Fever’. 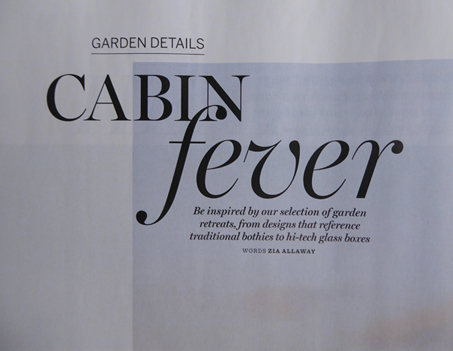 Published in Homes and Garden’s September issue the topic of conversation was garden retreats. APL award winning project Priory Road. into the overall design is a lot more challanging. For this project the only solution was to design and build a den from scratch. Priory Road was a small garden so it was crucial to maximize all the space available. children, a place that they could camp out with friends but without compromising the overall aesthetics of the garden design. It had to work both architecturally and practically. Priory Road was a fun project to work on and the clients were lovely. Hear the word trend and it starts to sound expensive – right? But, to be on trend doesn’t mean you have to take out a loan to achieve it. It’s all in the small details. However, whilst some garden trends are keepers, thankfully others aren’t adverse to change (remember bell bottoms?) I rest my case. Ok, for an example: over the past few years the garden designers at Landspace have noticed a strong trend for the buzzword ‘sustainable’. Clients have been genuinely interested in using sustainable products and there has been a defining increase in the trend to design gardens that are sustainable, ethical and that will attract wildlife into their outdoor spaces. Clients are choosing trees and plants that support the local wildlife and for those that have children – areas of the garden to educate them about the natural world. Keen for their little ones to have hands on experience there has been a notable increase for the request for raised beds for growing home produced fruit and vegetables. This in our opinion is a keeper. Trends that we would happily see the back of are masses of amenity style concrete paving and being asked for no maintenance planting. This we place in the – not adverse to change category. So, what other trends do the designers at Landspace predict for 2016? Continuing the sustainable theme, the collective feedback from the design department is Kebony. Although there is a general trend away from decking, when it is a ‘must have’ for the design, Kebony is our wood of choice. Why are we championing this wood? Well, that’s easy to answer. Developed in Norway, Kebony is a softwood that has been treated to behave like a hardwood. The process is completely eco-friendly and the wood has been given the Nordic Swan Eco-label by the Nordic council of ministers. The transformation process of turning softwood into hardwood is completely non-toxic and the resulting Kebony is not toxic to humans. It is not known to splinter like hardwoods and is often selected for use as Kindergarten decking. The wood starts off with a deep brown colour that turns to an attractive silver-grey patina over time. All the wood is sourced from sustainably managed forests and carries the FSC® certification. Saving the hardwood forests of the world from unsustainable logging is a ‘no brainer’. Other trends predicted include; monochromatic colour planting schemes, painted fences and boundaries and the use of traditional clay pavers to replace concrete and stone. Why the landscape designers at Landspace are championing clay pavers. Clay pavers have been creeping into the Chelsea flower show for many years. 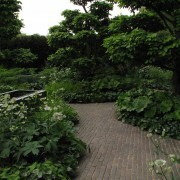 Tom Stuart-Smith and Cleve West both created award winning gardens using clay pavers. But it is only in recent years that this resurgence has found its way into the domestic garden. Clay pavers look (in our opinion) both stylish and aesthetically pleasing to the eye. As a product they are very versatile and look equally at home in a stylized ‘contemporary’ garden as they do in an informal cottage ‘arts and crafts’ style garden. The use of clay pavers is far more environmentally friendly than vast areas of paving slabs. It is also relatively easy to establish shallow rooting, creeping plants to grow in between the laid pavers. In a sunny aspect try growing plants such as: Thymus serpyllum, Thymus pseudolanuginosus or Thymus ‘Doone Valley’. You could also try growing alpine strawberries, (Fragaria vesca). December 3rd, 2015 at 6pm. When the Oxford street lights are switched on you know that Christmas is just around the corner. For the past 56 years, the lights have become a traditional fixture for this infamous shopping street. Having been a good couple of weeks since their switch on it will soon be time to turn on the tree lights at Trafalgar Square. 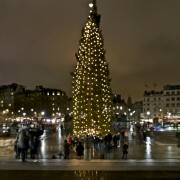 But it isn’t any old tree that sits in Trafalgar Square. The tree is a Norwegian Spruce, is usually 70ft high and has been growing for anything between 40-60 years. The tradition goes that the tree lights are lit on the first Thursday in December and remain lit until January 6th on the following year. 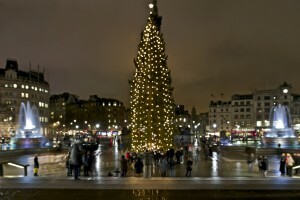 The tree is always a Norwegian Spruce and is a gift from the citizens of Oslo. It is a thank you to the people of Britain for their assistance during WWII. This tradition began in 1947. What is the best Christmas tree? I know it sounds a bit of a cop out but this is really down to personal taste and how long you want the tree to last. 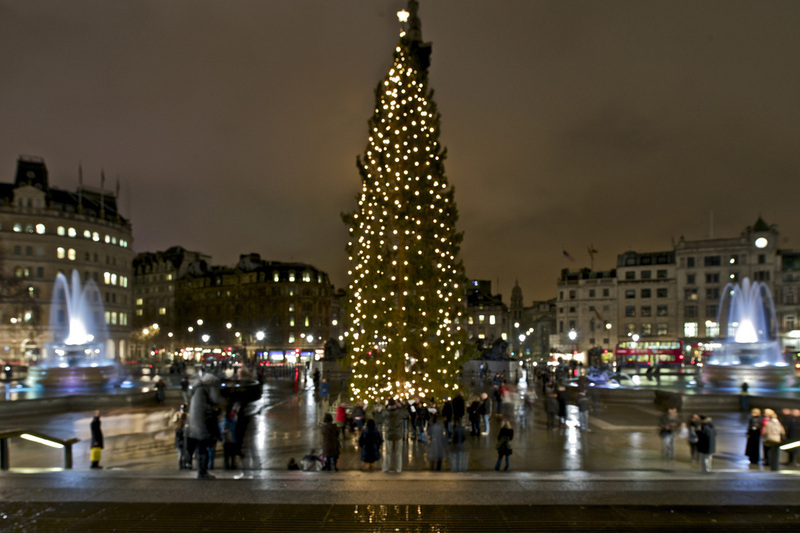 The traditional British Christmas tree is the Norwegian Spruce and is much loved due to its amazing scent. The downside is that the tree quickly drops its needles once it is cut down. This might prove to be a problem if you are planning to decorate the tree with family heirlooms. Needless to say, you wouldn’t want to see your priceless baubles sliding off needleless branches now would you? So dress with caution. It is also a tree with a wider base and might not sit comfortably in a small room. If you are looking for a tree that is narrower than the above, doesn’t drop its needles so quickly and you aren’t too concerned about aroma, then the Nordmann Fir is a good choice. Although you will pay nearly double the price for this tree. It has a conical shape and has dark green needles. It is a very good-looking tree. The number one choice of Christmas tree in the States is the Fraser Fir. Its appeal being that it has a similar form to the Norwegian Spruce but doesn’t drop its needles as quickly. It does have a slight scent but not as notable as the Norwegian Spruce. It also might not be an option for you if you like a traditional straight leader. Fraser Firs tend to be a little bit expressive when it comes to supporting the Christmas angel and this might be a deal breaker for those where symmetry is essential. The Noble fir has needles that tend to tilt upwards and are a very attractive grey-green colour. The branches are very sturdy and especially suitable for those who like to adorn their tree with weighty trinkets. This might be the preferred option if safeguarding the family antiquities is at the top of your list. Another option on the festive tree repertoire is the Douglas Fir. Like the Fraser, it has a narrower base, so is ideal for a smaller room. It has light green needles that carry a unique scent of citrus and is relatively good at retaining needles. There are other variations out there but these are the top 5 presently parading on the growers’ lists. Many growers also offer pot grown trees that can be planted out in the garden after the season comes to an end. Thus, avoiding adding to the carnage of discarded, unloved, tree skeletons that line the sides of the streets when everyone has had their wicked way with them. Do give careful consideration when choosing a pot grown variety. Hate to state the obvious but trees have a tendency to grow and before you know it, your cute little miniature will be towering above your roofline. Where can I buy a good quality Christmas tree? It is always best to buy a tree that has been freshly cut and has not been hanging around. A good starting point would be to visit the British Christmas Tree Growers Association website They have a comprehensive list of certified growers. We recommend, Christmas Forset for London and our personal favourite is the Rougham Estate in Suffolk. 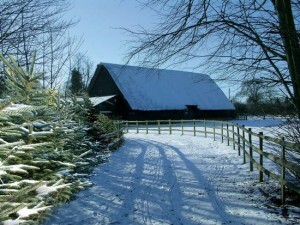 Blackthorpe Barn has a very friendly atmosphere and I guarantee a visit will put you in the Christmas spirit. If you are looking to have your tree delivered don’t rule out by distance. Scottish Christmas Trees deliver to the UK and were awarded Best Living Christmas Tree award 2009 by the BCTGA. Caring for my Christmas tree. Remember, if you want a tree to last, look it over very closely. There are a few tricks to help you decide just how fresh your tree is. The first thing to do is cast your eye over the tree and ask yourself whether the tree looks dry. Do the branches look brittle? If they do, this is not a good start. Next, hold the tree by its leader and give it a gentle shake. A good way to do this is just lift it a few inches off the ground and give it a couple of taps on the ground. If the tree drops its outer needles without much of a fight, it’s probably not going to last the week never mind Christmas. Once you are satisfied with your choice of tree there are few simple care instructions to follow if you want to get the best from your purchase. If you aren’t planning on putting up your tree straight away ideally it should be left in a cool shady spot outside and preferably in a bucket of water. When it is time to bring it indoors, lop off about ½ an inch from the stump so that the pores of the tree open up.Your tree can be supported using a purpose built tree stand with water reservoir. Alternatively you can place your tree in a bucket and support it by using small stones or screwed up pieces of newspaper. Whichever option you choose make sure you place you tree as far away from direct heat as possible and replenish the water supply daily. You are now ready to get decorating. https://www.landspacedesign.com/wp-content/uploads/2015/12/Trafalgar-Square.jpg 682 1024 Kate https://www.landspacedesign.com/wp-content/uploads/2015/02/landspace001.png Kate2015-12-02 21:44:342018-05-18 12:28:42It’s that time of year again. We recently went to visit a property near Highgate. The client had just purchased it – at what appeared to be a very good price. They had bought the house as a renovation project and had asked us to design and build a garden for them. Unfortunately, it was during the site visit that we discovered Japanese Knotweed. This is not only a homeowner’s worst nightmare but it becomes even more problematic when the offending plant has originated from the garden next door. Unfortunately, as a responsible garden design and build company we will not be able to carry out any landscaping that entails the removal of Knotweed contaminated soil. 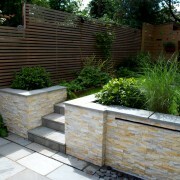 We can however, design you a beautiful space in readiness for when your garden is declared Knotweed free. Japanese knotweed (Fallopia japonica) as the name suggests originates from Japan. It was brought to the UK by the enthusiastic plant finders of the Victorian era. They naively brought it back to the UK to plant in their gardens based purely on its cosmetic appeal. They had little understanding of just how much of a nuisance this innocent looking plant would become in the forthcoming centuries. It has been purported that there is not a six-mile square area that is Knotweed free. It has been described by the RHS as a thug. The plant is so tough and determined that it finds no problem ripping up tarmac and penetrating flooring in houses. In its native countries such as, Japan, China, Taiwan and Korea the plant is kept under control in a natural eco-system by its many pests and diseases but in the United Kingdom and other parts of the world there are no predators and the plant is free to roam without being impeded. How do I get rid of Japanese Knotweed from my garden? Can I get rid of it myself? The plant spreads indefinitely on one root system. What this means is that it sends out runners underground that spring up all over the garden. It is so tough and resilient that it can withstand being hacked at with an axe, being set fire to and being doused in herbicide. It is so invasive that it can grow 10 cm per day and it only takes a slither of the plant stuck to the bottom of a boot to be inadvertently introduced to a new area. It is such a problem that the Environmental Agency has put a control order on this plant. It is not illegal to have Knotweed on your land or in your garden but it is a criminal offence to allow it to grow onto other people’s property and you could be prosecuted for causing a private nuisance. Japanese knotweed is classified as a harmful and invasive weed. 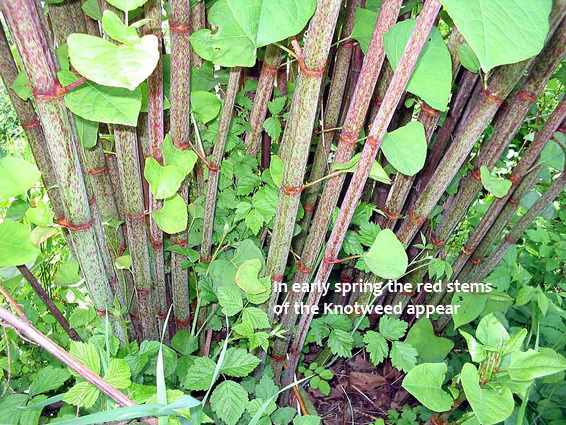 Yes, in theory, you can treat the Knotweed yourself and there are a few ways to approach this. Non-biological controls of digging out can be employed but this is a laborious task. The roots of Knotweed can penetrate to depths of at least two metres and making sure you remove all the pieces is almost impossible. If you leave even the slightest sliver then the plant will grow back. This method also creates a problem with regard to disposal. 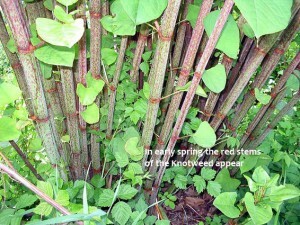 Knotweed is classified as a controlled waste. This means that you have to use a specialist contractor who is licensed to remove and transport hazardous waste to an authorized landfill site. It is important to bear in mind that wrongful disposal of Knotweed not only incurs hefty fines but could also see you facing up to 2 years in prison. I have heard that having Knotweed in your garden puts mortgage providers off lending money. Is this really true? Yes, unfortunately this is the case but not all is doom and gloom. Now that mortgage lenders are more educated on the subject the panic has subdued a little. However, if they are going to lend to you they will require a plan of action and detailed assurances that you will be employing a specialist contractor to eradicate the problem. They are aware that the removal of Knotweed takes at least 3 years. Also be aware that if a valuer carrying out a valuation on behalf of a mortgage lender discovers Knotweed in your garden, then they are obliged to include this in the report. Finding Knotweed in yours or in a neighbour’s garden can have a substantial effect on the price of your property. Some lenders will automatically refuse to lend money on the discovery of Knotweed. Others will lend but will want to see a treatment plan or management plan in place. They will also request to see an insurance-backed guarantee. Let’s end on a positive note. 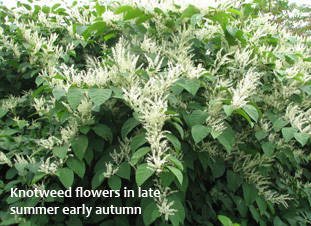 Scientific researchers have spent the past 5 years carefully studying Knotweed’s many pests and diseases and have narrowed it down to the pest Alphalara itadori. Researchers for CABI, (a not for profit international research body specializing in agriculture and the environment) announced that Alphalara itadori successfully survived through the British winter. They have been studying the insect very closely at its test sites across the UK. They are extremely hopeful that it will be available for general release as a natural biological control for this nuisance plant. 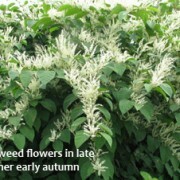 https://www.landspacedesign.com/wp-content/uploads/2015/11/Fallopia_japonica-flowering-text.jpg 226 311 Kate https://www.landspacedesign.com/wp-content/uploads/2015/02/landspace001.png Kate2015-11-27 15:17:062015-11-28 13:46:02We need to talk about Knotweed. It is always lovely to get feedback from your clients about a garden that you have designed and built. 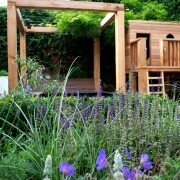 It is over 2 years ago since we designed and built a family garden in Strand on the Green, Kew. 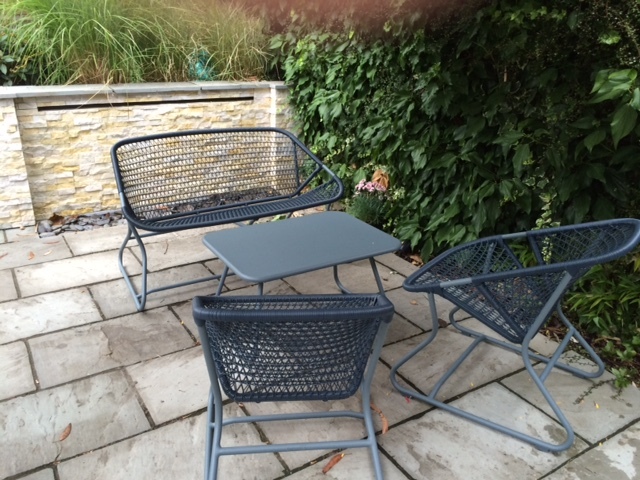 Recently, we received a lovely email from our clients updating us on how the garden has evolved and telling us how much it has changed the way they use their outdoor space as a family. Creating a space for children to be active and adventurous whilst maintaining an adult zone can be challenging, especially in a small garden. We remember this project because it made us have to think of clever ways to integrate outdoor storage within the children’s play area without it being an overwhelming presence. We were also very conscious about designing a garden that met the brief and was achievable to build within the client’s budget. The garden is terraced so there was a fair bit of landscaping involved. The clients also opted for a planting design and maintenance plan. This we highly recommend as our planting designer can choose the right plants for the right aspect. By doing this the plants have a very good chance of thriving their way into maturity. A planting plan also allows us to know exactly how many plants will be needed. 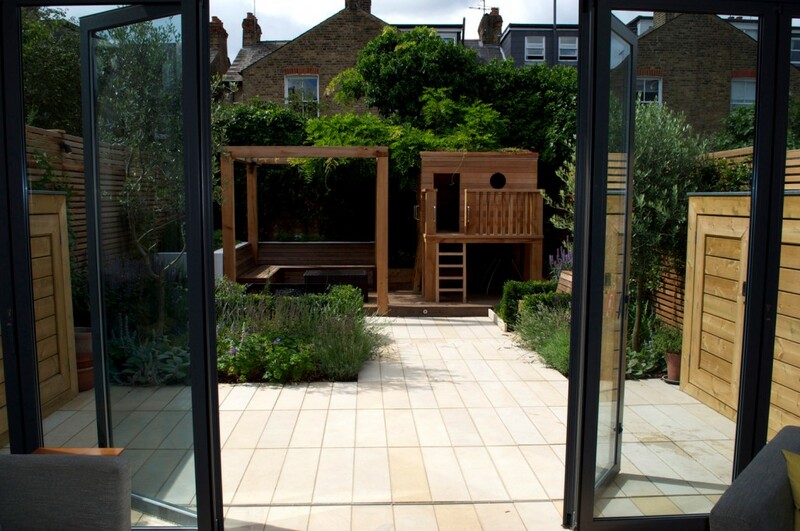 This project was an award-winning garden, complete with: water wall, new planting, lighting, play den, climb wall, outdoor storage, sandstone steps and patio. We really hope that you are both well and the business is thriving. We’ve progressed the garden a little this summer so thought I’d send you a few pic’s for you to see how it’s all looking. 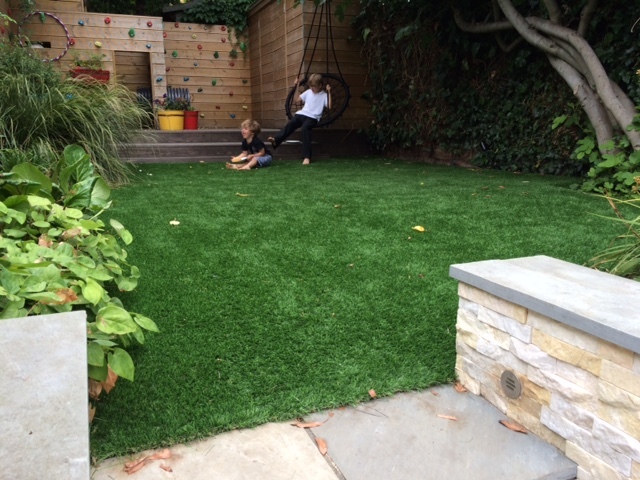 The biggest thing is that we finally succumbed to artificial grass! We really tried with the real stuff but having had such a soggy winter it was just a muddy patch for a good 5-6 months – which was no fun. The artificial lawn is amazing and has transformed the way that we all use the garden so we are really happy with the decision. The IKEA hanging chair appears to be impossible to get hold of, so we’ve recently bought a circular swing like you get in playgrounds, the boys love it and are constantly climbing on it and spinning round! 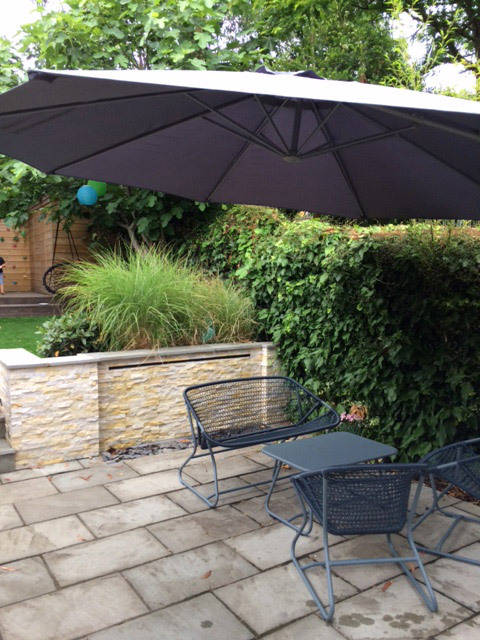 Unbelievably we’ve also only this year bought out garden furniture, and in the recent hot weather added an giant parasol to the patio to give us some much needed shade in the day. So that’s it, all the extra bits and bobs now complete! https://www.landspacedesign.com/wp-content/uploads/2015/02/0012.jpg 531 800 Kate https://www.landspacedesign.com/wp-content/uploads/2015/02/landspace001.png Kate2015-11-02 17:00:592018-05-18 12:41:31It is always lovely to get feedback from your clients about a garden that you have designed and built. FAQ: How much will it cost to have my garden designed and built? Well, the long and short of it is – as much as you are prepared to pay. The principle of creating a beautiful outdoor space is no different to that of creating a beautiful bathroom or kitchen. The higher the quality of the materials you use will mean that the final costing will be more expensive. You wouldn’t expect a handcrafted cast iron bath to cost you the same as pre-fabricated moulded plastic. Or for stone flooring to cost you per sq meter the same as lino. The same is true for patios and decking. For example: sandstone paving will cost you less per sq meter than granite and softwood decking will cost a lot less than Ipe hardwood decking. Basically, the overall cost of building your garden will depend on the complexity of the layout you decide on and the quality of your chosen materials. 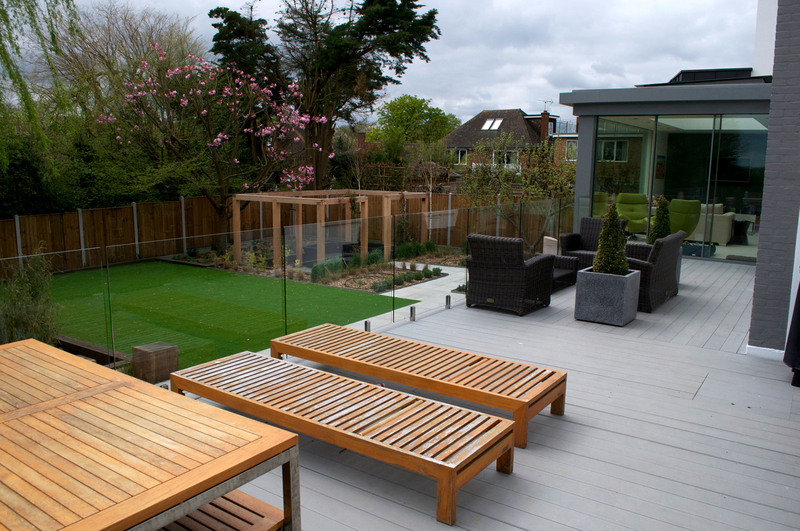 A basic layout of a patio or deck, lawn, flowerbeds and boundary fencing can start to rise in cost when you add the word bespoke into the equation. 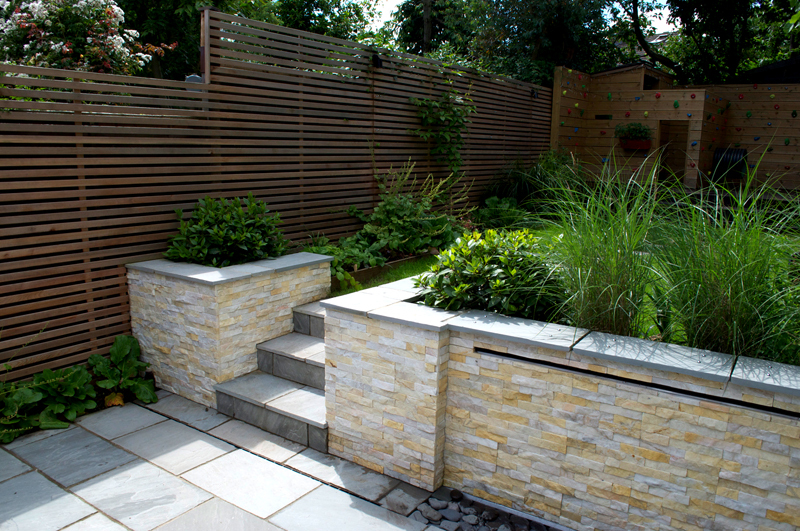 Block work rendered raised beds with bespoke integral seating, granite paving, water features, pergolas, outdoor lighting and mature planting will see the cost of your project incrementally increase into a higher pricing band. The cost of a project also depends on the current state of the garden and how much clearance and groundwork preparation and excavation is required prior to its construction. This really depends on what style of garden you are after. Having designed and built many projects over the years, everyone at Landspace would agree that having a comprehensive design in place is crucial when working with tight budgets. 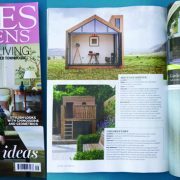 It’s all about making the best of the space you have and there are many tricks that designers have learnt that can help make your garden feel more spacious. 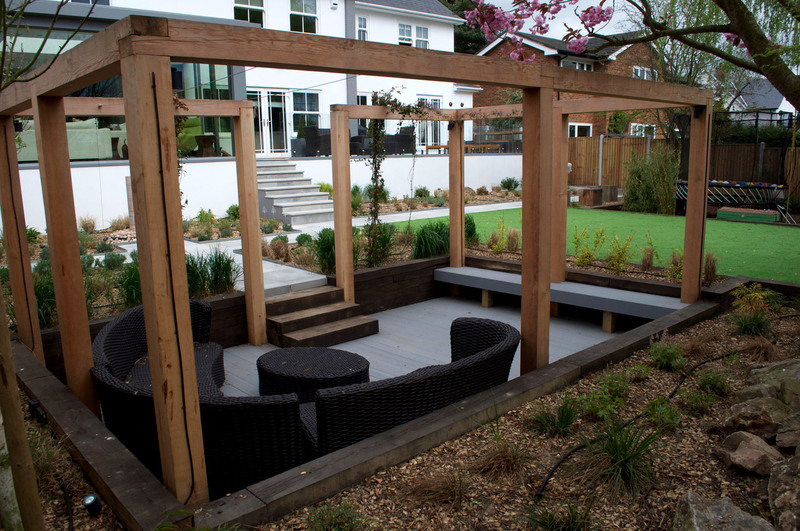 Garden designers are trained to understand how to connect your outdoor space to the architecture of your house and its surrounding landscape and will be able to create an exciting space for you to spend time in. A qualified garden designer would have also studied planting design and will have a sound knowledge of the trees, shrubs and herbaceous plants that would be a suitable palette for your garden style, aspect and soil type. What are the benefits of choosing a company that specializes in design and build? All our gardens at Landspace are designed in consultation with our landscaping team and a dialogue is continually taking place. This close relationship allows our design team to create gardens that are realistic to our client’s budgets and most importantly that they are structurally achievable. This way the design team are constantly pushing boundaries in design whilst our landscapers are being challenged to apply their expertise and knowledge to make these schemes a reality. We are also able to quantitatively estimate if the design will come in on budget. Any adjustments in quantities, materials and special features can be swiftly made without delaying the build of the project. There are many positives in choosing a landscaping company that has in house design as it offers the client a streamlined service, seamlessly moving from the initial design stage and into the build phase. 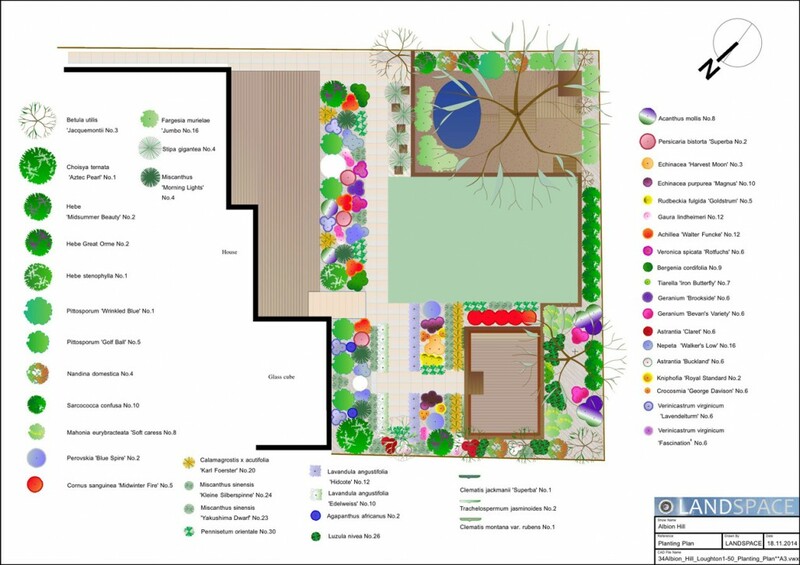 What can expect if I decide to commission Landspace to design and build my garden? At Landspace, our initial starting point for any project is the client consultation. This is where we get to look at your garden and find out from you how you would like to use your space. Once you decide that you would like us to proceed with your project you will commission us to commence work. The next step is the site survey where we plot the boundaries of your land, house and any special features that require to be recorded. If you have opted for a full design we will offer you 3 design sketches. These will give you an overview of how we see your garden flowing and will position all the elements that we have discussed together into a cohesive plan. At this stage there might be elements from Sketch 1 and 2 that you would like to combine and we can adjust the sketch plans to accommodate this. Once you are happy with the outcome we will finalise the design in CAD. The garden is then priced and we can tell you exactly how much it is going to cost. If at this point you need to change materials, reduce paving or remove special features, this can be done relatively easily with out too much compromise to the overall design. The same is for if you wish to add special features and extras such as lighting. We will also give you a schedule and order of works so that you can see exactly what to expect and when to expect it. A deposit will be required for materials before Landspace will commence the build. As a company we pride ourselves on causing as little inconvenience to you the client as is possible. All our landscapers take pride in their work and we always clean up at the end of each day. If you are not sure what you want to do with your garden, why not email Landspace at info@landspace.co or call us on 0845 805 1394. We are always happy to talk over your ideas. Whether you want your garden designed and built or just your garden designed, we offer a no obligation initial consultation. We look forward to hearing from you. https://www.landspacedesign.com/wp-content/uploads/2015/04/Loughton-08_1.jpg 996 1500 Kate https://www.landspacedesign.com/wp-content/uploads/2015/02/landspace001.png Kate2015-08-24 12:00:432018-05-18 12:38:55FAQ: How much will it cost to have my garden designed and built? Investing in your outdoor space – can you afford not to? Making the most of your garden. Why you should invest in your outdoor space. Or: Investing in your outdoor space – can you afford not to? There are many hidden benefits to having your garden professionally designed and built. Homeowners are often very hesitant to spend money transforming their outdoor space but if they were making money in doing so, would they approach their gardens in a different way? Well, according to the estate agent Marsh and Parsons, outdoor space in London is a tradable commodity with a price tag of £ 897 – £1,925 per square foot. In London, having a beautiful garden to retreat to, could add anywhere between 12 – 25% to the value of your house. Besides adding value to your property there are other welcome benefits for investing in your garden. Having access to outdoor space and nature has a positive and beneficial effect on our health and general wellbeing. Plants and wildlife are tonics for our stressful urban lifestyles. Research suggests that just three to five minutes spent looking at views dominated by trees, flowers or water can begin to reduce anger, anxiety and pain and to induce relaxation. 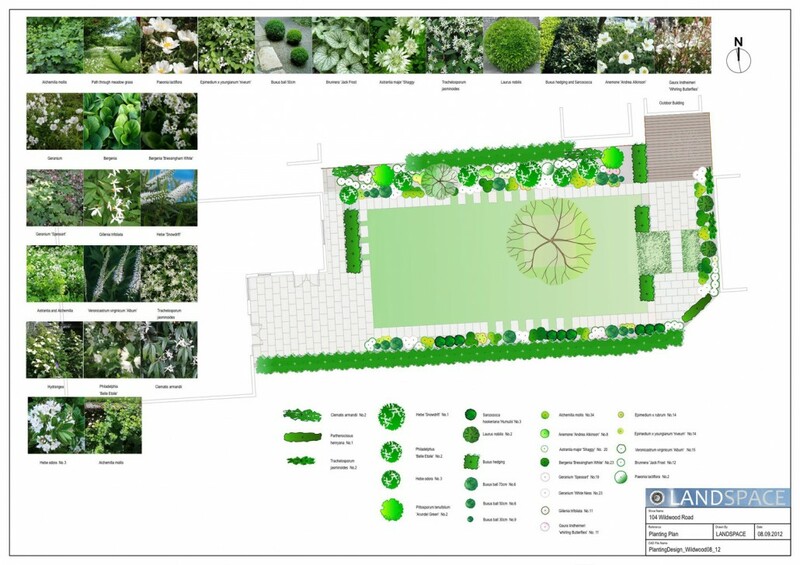 https://www.landspacedesign.com/wp-content/uploads/2015/02/Kew_Priory_Finished151.jpg 996 1500 Kate https://www.landspacedesign.com/wp-content/uploads/2015/02/landspace001.png Kate2015-07-27 12:19:082018-05-18 12:36:33Investing in your outdoor space – can you afford not to? Hearne Road wins Landspace an APL 2015 award. We are really delighted to have won an award at this years APL awards ceremony. 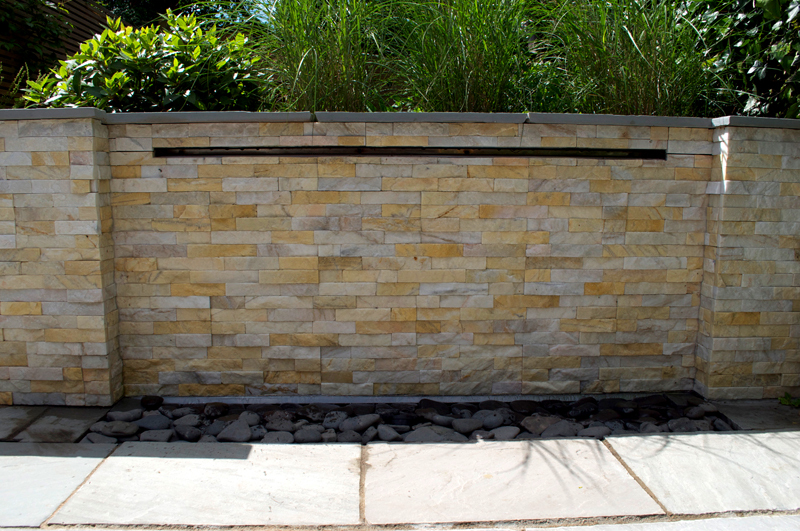 The project was for Hearne road where the clients wanted us to design a water wall that would remind them of their travels to Ibizia. They also wanted to introduce the sound of water into the garden to mask the constant sound of traffic coming from Kew Bridge. It was very important to calibrate the flow of water so that it had a slow but constant trickle across the face of the wall. Getting this right was important, as the sound of water can sometimes be too overpowering and hence, not very relaxing. We managed to find that balance and the clients were very happy with the end results. https://www.landspacedesign.com/wp-content/uploads/2015/02/0012.jpg 531 800 Kate https://www.landspacedesign.com/wp-content/uploads/2015/02/landspace001.png Kate2015-03-13 20:00:212018-05-18 12:35:18Hearne Road wins Landspace an APL 2015 award.